CHICAGO -- Owners of 7-Eleven stores in Illinois are warning of massive layoffs unless the Illinois Lottery protects them from competition from the online sales that are expected to start this year. The franchise owners said that online lottery sales could force them to lay off 7,000 employees statewide, according to a WBBM Newsradio report. Joe Rossi, the head of 7-Eleven Franchise Owners Association of Chicagoland (FOAC), estimated that lottery sales bring in 30% of the business at 7-Elevens, because lottery buyers buy an average of $5 in goods on top of their tickets. Rossi said at a press conference at a Chicago 7-Eleven store that he is not trying to block internet lottery sales, just suggesting the lottery find a way to protect 7-Eleven lottery business and jobs. Hei is recommending that the state lottery require players to fill up a Lottery credit card at 7-Elevens--leaving the store owners with their present 5% cut of the business--rather than allowing players to gamble without limit on their credit cards on line at home. The move to online lottery play is set to begin in April, the report said. The U.S. Department of Justice in December issued a legal opinion on the matter that paved the way for online sales to begin. Lottery officials estimate the state will take in $150 million more annually once sales go online, and will attract hundreds of thousands of new players, said the report. Officials have promised that the site for online sales will be secure and limited to Illinois adults. Illinois convenience stores and gas stations want to remain the "gatekeepers" to Illinois lottery tickets, added a report by the State Journal-Register. Leaders from the Illinois Petroleum Marketers Association/Illinois Association of Convenience Stores (IPMA/IACS) support legislation by State Representative. Jim Watson (R) that would require individuals to purchase a debit card in-store before accessing the Internet lottery. Bill Fleischli, executive vice president of IPMA/IACS, said member stores are concerned that an online lottery will lead to a loss of revenue and a loss of jobs. "They say that with the Internet lottery, you will see a reduction in foot traffic and a reduction in ancillary sales, and because of the income loss, it may mean a loss of tax revenues and there will be a significant loss of business revenue," Fleischli told the newspaper. "If that happens, you would see a reduction in the workforce." Out of the 4,500 convenience stores in the state, Fleischli estimated that 4,000 of them sell lottery tickets. Losing a job or two at each of them could result in the loss of 4,000 to 8,000 jobs across the state, he said. Fleischli said they reached this estimate by assuming that the online lottery sales would cause lower revenue sales, forcing to stores cut one of their lottery salespersons. But not every retail store owner agrees with assertion that online lottery sales will harm their bottom line. Last month, Grady Chronister of Chronister Oil, which owns Qik-n-EZ stores in Springfield, said lottery sales are "a very, very small commission for us." Lottery sales are "an integral part of our industry, but not necessarily the main reason we are in business," he told the Journal-Register. "I don't necessarily agree with that whole thing that people come to our stores just to buy lottery tickets." Curt Adams, president of Illinois Ayers Oil Co., who said he was extremely disappointed to hear that lottery tickets will be sold online. "The bottom line is, the less sales inside our store, the less sales tax revenue for local and state governments, not to mention less income tax," he told the paper. Adams said the profits his company receives from lottery ticket sales can vary, but that ticket sales make up 8% to 10% of his revenue. 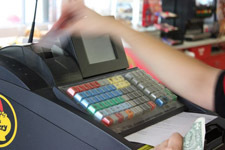 Adams added that his stores see more customers if the reward for a particular lottery is high. Lottery ticket retailers earn a 5% commission on the tickets they sell. They can make additional money by cashing winning tickets up to $600 in their stores and for selling winning tickets of $1,000 or more. So far, only Lotto and Mega Millions will be available online. Customers who wish to play Powerball or an instant win game have to go into a store. There is legislation to put Powerball online too; Senate Bill 3497, sponsored by Sen. Jeff Schoenberg, is sitting in committee, said the report. Fleischli said his organization does not oppose an online lottery outright, but they want the process slowed down so that a solution can be devised that would benefit retail stores. NACS opposes the online lottery and is calling for Congress to ban it, the report said. The group asserts that the online lottery, like Internet gambling, is illegal under federal law. Fleischli said he is scheduled to meet with Illinois superintendent of the lottery Michael Jones on Tuesday.